Creativity and its pursuit is at the core of the arts world, but creativity has also led to the greatest achievements in science and technology. Creativity is also sought after and highly valued by employers in many diverse fields. However, creativity is not necessarily recognised as a key skill in health – but creativity and its inherent divergent thinking* allows flexibility, enhanced coping abilities and inventiveness in clinical practice. The divergence opens up other outputs such as awareness, easy introspection and excitement. We talk a lot at NOI about brain outputs such as the cognitive, motor, endocrine and immune system outputs, but perhaps creative performance could be considered the ultimate whole human output – a varying blend of cognitive, emotional, chemical, motor, neuroimmune, memory, and sensory contributions. Creativity must be a core skill to better cope with whatever life brings. Knitting as Betsan presents it (a very useful activity to get you out of the chair and into life) is surely a metaphor for any other creative outlets – cooking, music, pottery, fishing, singing, dancing, painting, writing… divergent thinking will lead to even more. With our current headspace at NOI based on the neuroimmunological links to learning, coping and creativity, and reading books such as Betsan’s, it seems so clear that the place and potential of creativity in health has been greatly underestimated. Creativity has a biological basis and, as perhaps the ultimate whole-person output, can powerfully unleash beneficial bioplastic change. And boys – start knitting – what a way to get noticed by the girls! Thoughts on the place of creativity in rehabilitation welcomed in the comments below. *Divergent thinking is a thought process or method used to generate creative ideas by exploring many possible solutions. I’m going to throw gardening into the therapeutic creative output space – the mind runs free, sometimes into those not so easy spaces but with less “impact” on the physical – creativity creates a safe space to explore the “not so safe” – stepping into a SIM environment to allow you to explore a DIM…. Nice. Thanks Leanne – many of the narratives I’ve collected talk about using knitting to explore ‘not so safe’ thoughts or to process a session with a psychologist or psychiatrist. Many talk about being able to face ‘dark thoughts’ without getting stressed by them as they knit enabling them to look at these thoughts from a different viewpoint and then file them away. The word ‘knitting’ has been the biggest barrier to this work – everyone has their preconceptions. So much so that when I started back in 2005 I had to call it a ‘bilateral rhythmic psychosocial intervention’ to get people’s attention! However, there are times when we can use the apparent uncomplicated, simple, safe viewpoint of knitting to our benefit. The word itself doesn’t usually trigger any feelings of danger – if granny can do it, so can I :). I would completely agree with you about gardening but I’ve found some people immediately think of the potential dangers in it e.g. lifting, digging, physical exertion. As with any graded approach the idea is to get these to gradually work up to a variety of therapeutic creative activities including gardening. I like to call it a graded approach back to life. I love this article…I am a dancer and often in a lot of pain, but when I am dancing, doing class etc., I often get quite lost in the moment of creating the movements that I forget about my pain. It’s because my concentration gets shifted to something way more interesting for the time being – and in choreography, to problem solving…it’s a great distractor. I think you get this fusion of rhythmic movement, thought and feeling in dance, yoga and Tai Chi (and knitting!) too. I would describe it as somehow unifying. All of this is true, attested to by the stories in “Love in Every Stitch; Stories of knitting and healing”. Relief from chronic and mental pain is two sticks and a string away. Thanks for this great article! Research has shown a strong correlation between mental illness and creativity. On the surface, this would appear to be a bad thing. However I’d like to postulate that mental illness causes people to go looking for ways to be creative, because being creative helps them. There’s nothing like good music, dance, art, literature to cause the self to fade. Linda (above) said it best: “I often get quite lost in the moment”. Her interest in dance causes a single-pointed concentration and absorption. Discursive thought ceases and the self (which is made of thought) disappears temporarily. ‘The moment’ consumes her. This makes the present moment more real than the self. The present moment has an undeniable reality. Vincent Van Gogh — “I can very well do without God both in my life and in my painting, but I cannot, suffering as I am, do without something which is greater than I am, which is my life, the power to create”. If you see Van Gogh’s works up close, you’ll experience an awe and a stilling of the mind. That’s why his paintings (summed) have commanded higher prices than any other artist’s works in history. Hi – Perhaps rather than actively seeking something creative they are seeking something safe and constructive. I’m often asked about the link between mental illness and creativity. I think, as with all things, there is a balance. I’ve found those who are becoming more manic go off down lots of thought/creative avenues, in a largely uncontrolled way – sometimes something brilliant comes out of it, sometimes not. This cycle of events is fuelled by the boost of reward chemicals so they then crave more. Those with depression appear to go the other way and tend to gradually shut down. It would seem logical to me that a ‘balanced person’ has a more ‘balanced approach’. I would also say it depends on the nature of the illness and its severity. Certainly some of the patients who are referred to me are completely ‘closed down’ and need help to discover creativity again. They are uncomfortable with trying new things because of a fear of ‘failure’. Knitting is good because it offers these people a framework within which they feel safe- we can then gradually withdraw this framework until they are happy to experiment. We couldn’t put them in front of a blank canvass. Perhaps rather than actively seeking something creative they are seeking something safe and constructive. Patients often tell me ‘It’s the first constructive thing I’ve done in years.’ They experience success in something which is so important for sparking interest in the world once more. They feel excitement for the first time in a while….they smile. Once they experience this boost in feelgood chemicals they want more and then go out to seek more creative experiences. The key is to use it differently according to the individual’s needs – to regain some sort of balance. Those who suffer panic attacks can carry a project around with them and use the instantaneous familiar feeling of calm to stop the attack developing. This approach has been really successful. On the point of distraction I think creative thought can be an ongoing distraction, not simply something that occurs during an activity. People start planning future projects, visualising giving them as gifts and others’ pleasure, and they do this in between the actual activities. It’s also interesting how those with different mental health issues use colour differently. Those who are low are much more likely to use muted colours, beiges, browns and blacks. Those who are manic use bright neon colours and sparkles. In these situations I advise them to try other colours. For example a short (quick fix/reward) project in bright colours for those with depression. Interestingly we had one lady with fibromyalgia who couldn’t touch brightly coloured yarns. They ‘stimulated’ her too much. So we compromised and used a dark yarn with bright flecks and worked up from there. She can now use any colour. One lady likened the introduction of colour into her ‘grey world’ to a jolt of electricity. The effect of texture and touch is also very interesting. The work suggests that touching something good makes you feel good and this overrides the effect of the colour. It’s a fascinating topic and it’s great to have this type of discussion here. Nice post bets. Are you an OT? Psychologist? Aussie? EG Physio – I live in the beautiful city of Bath in the UK. I was a physio until 2002 but left because I became frustrated by the system I found myself in. Had a complete change of career and became a freelance production editor for a range of camera and computer magazines. Ended up on a large craft portfolio and was put in charge of the letters pages. They received sacks full of letters every day and about 98% of these talked about using knitting and stitching as therapy for a range of problems. The striking thing was the large numbers of people for different backgrounds and cultures around the world saying the same thing. I was able to read these with a ‘medical head’ and it was exciting. At first I thought it would be a great way of motivating those I’d visited on my community rounds, to get them interested in the world again, to get give them the feeling of being successful at something from their arm chair but I soon realised it could do a lot more than this. I missed my clinical work, I love contact with people and patients, so I asked my local pain clinic if they’d be interested in testing out my theories with a social knitting group. That’s been running since 2005. I do a lot of pain education under the radar through the group, most of the participants have complex issues and wouldn’t have got the long term support they need without this group. As a clinic it enables them to monitor, support and motivate these patients in an ongoing way at very little cost. He’s worth studying, Van Gogh. Very few comapre with him when it comes to the topic of creativity. “I put my heart and my soul into my work, and have lost my mind in the process”. “I experience a period of frightening clarity in those moments when nature is so beautiful. I am no longer sure of myself, and the paintings appear as in a dream”. Van Gogh wasn’t suffering madness or schizophrenia. There’s nothing in his extensive correspondences to indicate that he was anything but lucid and sane even up to the end. However he was very depressed for most of his life, and the reasons for this are quite obvious. When he threw himself into his work he felt relief. And this guy… he was an extremist. Nothing was done in half measures, and he found a kind of reward in letting go of the self that that most people will never experience. And of course it shows up in the quality of his work. BUT… never in his life did Van Gogh properly treat his depression. The spiritual reward of his absorption would eventually abate and with that, his problematic thoughts would return in full force. Each time they returned, he felt the pain more keenly, and so he’d throw himself even more deeply into his work. And it cycled out of control. He became the most distinguished artist in human history, but in the process, his physical and mental health deteriorated to the point of suicide. The lesson about Van Gogh is very pertinent to the subjects of creativity, addiction, mental illness and pain. Ego health (or self-esteem) must be made the primary concern. Only once that’s established should one look to moving beyond the self. EG – I have nowhere near the knowledge you have about self but you are making me think about it more which is good. I like the challenge of looking at it from a different perspective, so thank you. I think this is an important first step in engaging people. The importance of being successful at something is shining through in this work. As clinicians I think that our first task is to find something our patients can be successful at and then build on that. We also do a lot for charity. Making things for people less well off than themselves changes their perspective on the world and takes their focus away from themselves. Last year we clothed all the children in a remote mountainous village in Lesotho. The children sent us back photos and a video where they sang a thank you song. The striking thing about the video was the completely barren landscape, yet everyone was so happy. Many of the patients remarked on this ability to keep smiling despite the hardship and having very little in life. We also knit teddy bears for the hospital’s A&E so that every child who comes into A&E receives one. The staff have said it’s made a huge difference in how the children respond and had made it much easier for everyone. This makes the patients feel worthwhile again – within their family and within society. They begin to find their place in the world again. On the point of Van Gogh I would go back to the word balance – you CAN do too much of a good thing and that’s where the therapy side of it comes in – helping people to use it as a tool and monitoring this. I’ve no doubt that knitting becomes addictive. Many use it to successful conquer destructive addictions such as alcohol and drug abuse, so over using it is something we look out for. Therapeutic knitting isn’t about getting people to sit and knit all day it’s about teaching people how to use it as a tool combined with health and wellbeing knowledge as part of a ‘whole-person’ approach to wellbeing. Unlike other creative activities knitting’s (and crochet) portability gives people a tool they can use any time anywhere. I would have posted on noijam but I don’t have an account. I taught myself to crochet last June with YouTube videos. It got me out of bed. It got me through my pain threshold of sitting more than 10 minutes gradually building up to the point where my physical therapist said the new pain was from sitting and that I needed to get up and stretch every 45 mins to an hour. Crochet has brought joy into my life. I still live my chronic pain, its just I look forward to every day because I have my crochet projects. This year my friend gave me her old iPhone which I can only use the computer since she can’t remember the password to clear her off of it. The blessing is I have an instagram account and can share with fellow crocheters all over the world. In a month and half I have over 200 followers! 2 tags you will be interested in which I’ll post below. We, the crochet community, lost a talented crochet designer – Wink/Marinke to suicide in June. Kathryn is creating an art show called Mandalas for Marinke to bring attention to depression awareness and people from all over the world are making mandalas and sending them to her with their story. Every day on her crochetconcupiscence blog she features a person who mailed in a mandala, something from Wink’s blog and something about depression. Hi Flo – thank you for your reply. Lovely to hear that crochet has helped you. I contributed to Kathryn’s book ‘Crochet saved my life’. Many of the ladies in my ‘knitting’ group at the pain clinic also crochet – it’s good to have variety. Crochet has most of the benefits of knitting particularly the rhythm and the portability. In order to enhance the benefits of crochet so it sits up there with knitting we have been teaching people to use a more two handed technique (you may already do this). 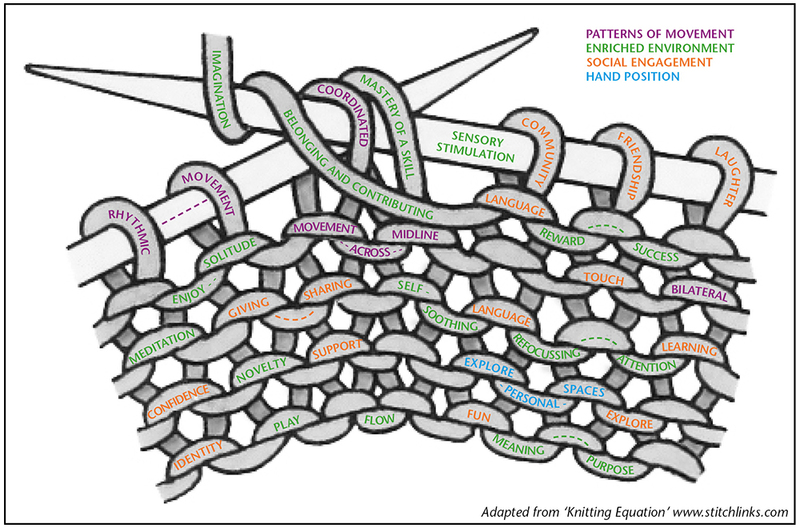 I think the bilateral, cross body movements of knitting are important. We’ve also found that some people get hand pain in the hook holding hand because of the particular grip and turning movement so we advise them to pace their crochet more carefully, combined with stretching and getting up and moving on a regular basis as your physio has advised you. I’ve been collecting stories from knitters and crocheters since 2005. There are so many that say knitting and crochet have ‘saved their lives’ given them something positive to focus on that they CAN do and be successful at. I started out knitting but could only use large needles because of the wrist pain, still, I did it because it gave me some worth as I donated the scarves to the local senior center. I couldn’t get the hang of purling even w/the help of a volunteer teacher so all I could do was make scarves. With crochet I hold the hook in a way that doesn’t hurt my hands and I make more than scarves! Lion Brand yarns Lion Brand Notebook posted in their email an article and short video on the importance of hand exercises which I discussed with my physical therapist and he tailored for me. It was through the LB Notebook posts on the health benefits of knitting and crochet that I learned of Kathryn as she wrote them for Lion Brand. A recent 5 month crochet-a-long with video tutorials I learned 26 new stitches. That’s a lot of new neuro-pathways created. I know the latest research says its good to keep learning new things. I can’t speak to your cross-body bilateral statement because it’s all Greek to me. I know what works for me and gives me joy. As for the mindfulness of knitting and crochet, it may help some, however, I need to have a book on CD or a video streaming to keep my mind from spinning while working on part of a pattern that is repetitive. There are some great replies above so I will share my experience of the importance of creativity in living with chronic pain. I am an artist and printmaker, I also have Complex Regional Pain Syndrome (CRPS). http://www.crps247.com/ which has dramatically altered my life http://www.crps247.com/my-story.html as I can no longer walk without crutches and use a wheelchair ; I experience without warning what is at times severe neuropathic pain in one foot. Fortunately my hands are still OK and my art is a now a key focus in my life and sustains me through many difficult days and nights. I discovered that when I am working in my studio I stop thinking about my pain and CRPS all the time and enter another world. My artwork is a compelling reason for hobbling out of bed each morning, it keeps me enthusiastic and wanting to live despite CRPS. The response from betsancorkhill August 27, 2015, makes the important point that creativity is not just about the actual physical activity but it also becomes something that we think about and plan for in between the actual activity. I have long believed that creativity can be a form of meditation because the mind clears of its usual thoughts and worries and enters another realm. Meditation helps slow down the sympathetic nervous system and this can help reduce the quantity and levels of our pain. I also believe art nourishes the soul and enriches our lives, something that material wealth fails to do. Hi Rosemary – lovely to meet you and thank you for sharing your powerful story. I think creative activities give you a different point of focus, a different perspective …away from yourself, but at the same time they give you a place in the world, a purpose, a meaning. One patient said to me “I don’t know how to describe it but my pain used to be here (making a gesture that took in her whole body), now it’s here (pointing to somewhere behind and outside her body)” which is fascinating. My work has been focused on knitting and the majority of stories I’ve collected talk about the meditative-like state of mind achieved through their craft. I think it makes the benefits of meditation much more accessible to a wider population including children, the elderly and those with learning disabilities. I also think you can enter different meditative states according to the project you choose – concentration on a mantra, mindfulness or transcendental. An interesting question “What has pain and suffering done to/for my creativity”? My first consciousness of pain and suffering probably goes back to age 18/24 months old. Imagine being in a cot alone at night, abandoned by adults, sitting amongst your own vomit, running a high temperature ( probably measles) in pain, sobbing and no one comes to your rescue. When they do they are angry that you you are causing trouble, have made a mess and spoiling their evening. Not a good start you might say for the creation of “Self”. It hasn’t been an easy road since that moment highlighted, early on by the factoid that you were an accident and your arrival had only made your parents unhappy, where as they had been happy before. You were told “Had you been an unwanted puppy they would have drowned you in a bucket!” (We already have enough material here for a whole psychotherapeutic conference!). Physical hard work from a young age, multiple accidents through sport, fast cars, fancy women and a few marriages later I find myself in Utopia despite the complex multititude of biopsychosocial issues that I have lived through. Yes I have my triggers and my flash backs. Like the man that has lost a leg, the limb will never grow back but you make the best of what you have left to work with. Life couldn’t be better now……..
What kept me going? What got me to where I am now? What saved me from being in a hell hole for ever?…….. I’ll tell you what……..My Pain……My Suffering……..Without it my creativity, my ” Minds Eye” would never have evolved, would never have found a way out of the hell I have lived through. Without my pain and suffering I would never have found the true gift God gave me of compassion and altruism. Without it I would never have found “Self” so don’t tell me creativity is a diversion away from self that’s crap! Pain and suffering is the only way to find Self………. Well there’s no doubt you didn’t have a good start to life. It’s obviously still fresh in your mind as most of us would have no memory of that early in childhood. Many of the patients I see have had similar experiences. Many have a history of trauma, abuse and I have no doubt in my mind that their pain is linked to this. I think the trauma conditions them to always ‘be on the look out’ to always ‘be on alert’. Most have had lots of psychological input in the past, and although I think these have a place in helping people to come to terms with certain issues I do question sometimes whether raking over the past over and over again reinforces the trauma again and again. I think there comes a time when we have to say – yes we recognise the trauma, it’s made you who you are today, but it’s time now to think about how you can live the rest of your life well. It would be good to hear your views on this. In terms of your comments on self – I don’t have an in-depth knowledge of self but I do think it’s important you don’t become your pain. I think there is a big difference between a person who is their pain and a person who has pain. I think you have a much better chance of living well if pain doesn’t become who YOU are. In terms of creativity and self – I think creative activities enable you to learn more about yourself, they enable you to explore yourself, they enable you to push your limits and challenge yourself and they enable you to nurture and be kind to yourself. Therapeutically, you can use creative activities with a specific aim or aims in mind and yes I also think, when you choose to, you can become lost in the process of creating, in the flow, and in so doing loose yourself, loose the sense of time, loose the sense of everything else but the process. Good on you DB – takes courage to own that story. How do you use this compassion and altruism in practice? A specific example would be great. I’ve always found activities that require intense concentration but no verbal thought to be immensely meditative. For me it’s shooting a basketball. A lovely thing about knitting is that you have materially produced something at the end of it. Interestingly, these type of physical activities have extremely strong feedback mechanisms built into them – simply, getting the stitch right, hitting or missing the shot. I wonder if that required modulation between input and output encourages the brain to harmonise interoceptive processing, potentially reducing pain (and hypertonic) output? That’s interesting. Knitters talk of an ‘ongoing reward’ that provides them with ongoing motivation. Each stitch is a success, each row is an achievement, and the end product is a bonus. Each stitch is a small step forward toward their end goal. It’s a great way of teaching goal setting and pacing. They learn that mistakes can be undone (they’re not catastrophic) and the end goal can be reached despite a few detours along the way. In fact the end goal is often richer because of those detours and the learning that has occurred as a result. It’s also OK to leave mistakes – they add to the uniqueness of the knitted item, like the Persian carpet weavers who deliberately weave in a mistake into their carpets because only Allah is perfect. It’s quite interesting to see that many of the patients who come my way are perfectionists so we do work at letting ‘mistakes’ go. It’s wonderful to hear you have found such joy in your crochet. Your story highlights so well the need to tailor activities to each individual’s specific needs, abilities and personal story. That’s where the therapeutic aspect comes in. I’ve been in close contact with Lion Brand over the years and they have helped to highlight the health benefits of knitting and crochet through their blogs and articles. As you say there is virtually no limit to the new skills you can learn through crochet and knitting so no problem with introducing regular novelty. There is always something new to learn, explore and be curious about and the large number of video tutorials and web-based forums are a great way of learning new skills from the comfort of your own home.